← Team Boy or Team Girl? I first installed the Charity Miles app on my phone back in April 2013 when I started running and training for my first half marathon. Since then, I’ve run and walked 800 miles for charity! Since each mile run or walked with Charity Miles earns $0.25 for the charity of your choice, that’s $200 that I’ve raised since I started using Charity Miles. Sure, $200 might not seem like a lot of money, but that’s money that I’ve raised simply by going outside and hitting the pavement. Since Charity Miles is GPS enabled, it only tracks miles that you run or walk outside. I wish that weren’t the case, as I’ve logged many, many, many more miles at the gym on the treadmill. Nonetheless, I’m still beyond happy with the money that I have raised over the past 2+ years, and can’t wait to continue to see just how much more money I can give back to charity. The majority of the money that I’ve raised has gone to Team RWB, the veterans support organization that both Preston and I are a part of. 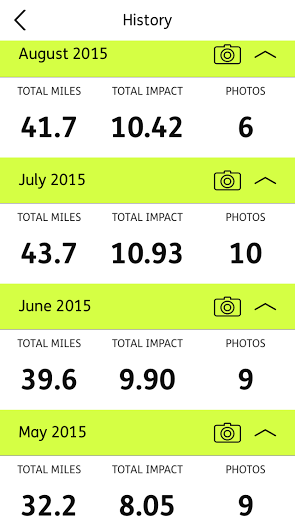 Now that I’ve reached 800 miles, I wonder how long it’ll take me to reach that 1,000 mile milestone. I’d like to aim to reach it before the baby arrives, but I also don’t want to push myself too far or too much. We’ll see if it happens! This entry was posted in Milestones and tagged Charity Miles, Team Red White and Blue. Bookmark the permalink. That’s awesome girl! I’m a big fan of St. Jude! That’s absolutely awesome! I’ve raised money in the past for Wounded Warrior Project as well as Crohn’s and Colitis and the ASPCA. I plan on downloading this app ASAP! Thanks for sharing! Love the Charity Miles app! Great jog getting 800 miles! I like to run for Alzheimer’s and Team RWB! I love this idea! I have heard of the charity app before but to be honest i’d forgotten about it. How do you know for sure your charity is actually getting the money? My favorite charity is Guiding Eyes for the Blind. They raise Labradors for service dogs and blind people! I had never heard of this but will definitely be checking it out. I’m really interested in volunteering with running as well as my Junior League stuff and this seems incredible. Such a cool idea! I’ve never heard of this before. My charity of choice is always the Pancreatic Cancer Action Network — I lost my grandpa to it about 10 years ago, and we were super close. Other than that, I am always first in line to raise money for anything animal-related!